Studiomaster showed two major new product series at Musikmesse for the first time outside of the US: the Starlight integrated sound and lighting speaker cabinets, which caused a major stir when shown in prototype form at NAMM this year, were given a European debut in final pre-production form, and the newly complete Horizon 2000 mixer range was on display, comprising two self powered and two passive variants. The Starlight sound and lighting cabinet is a world first, fully integrating FOH and monitor sound and stage lighting within a pair of portable trapezoidal PA cabinets. Comprising two stand or pole mountable, 2-way 12 inch or 15 inch cabinets, Starlight combines 250 watt self powered FOH reinforcement and a 50 watt powered side mounted monitor driver within each cabinet. Each cabinet features a rear panel mounted 2-channel mixer with one balanced XLR mic and line inputs, and one with balanced XLR and stereo phono inputs. There is a 3-band EQ and a separate monitor level control and input for a foldback signal from a mixing console. Each cabinet also incorporates a recessed side slot housing six high-power LEDs with dispersion lenses. The in-built lighting controller features 13 programs, including seven static colours, fade to colour change, sound to light; brightness and speed are also adjustable. The Starlight cabinets are supplied as matched pairs, with the LEDs and monitors angled inward towards the performers’ stage position. Starlight provides a straight out of the box sound and lighting solution for small venues and touring artists, and one that delivers substantial cost and manhour savings. 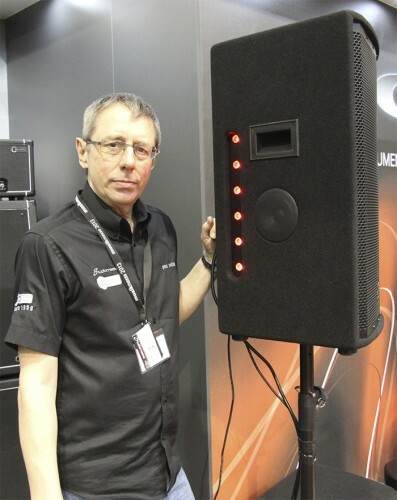 Speaking on the stand at Musikemesse, Studiomaster Head of R&D and designer of the Starlight series, Paul Belcher, explained: "The Starlight system is targeted at solo artists and duos, small bands, and DJs – where the monitor speaker is a particular bonus. It is also highly applicable in smaller venues and music bars; in fact anywhere where you need good PA sound reinforcement and a colour light show. "Simply mounted on a speaker stand, with power and audio signal connected, it is ready to go. It’s a feature configuration that in so many different applications makes perfect sense, and it is a unique concept that we plan to develop further in other product ranges." The Starlight cabinets were used extensively on live product demonstrations on the Carlsbro /Studiomaster stand throughout Musikmesse. The Horizon series mixers offer 12 or 20 input configurations. All feature twin effects DSP, dynamics processors and two way active cross-over, with the powered versions packing a colossal 2000 watts, flexibly assignable to FOH and / or stage monitoring. The new form factor features light aluminium panels and sustainable bamboo end cheeks that create a modern, elegant design with the emphasis on portability and minimum weight. The control surface is the result of a ground up re-evaluation, specifying only the necessary features and controls in order to minimise clutter and improve operability. The curved front trim panel features a concealed centre carry handle enabling even the largest model in the Horizon series to be picked up and carried in one hand. The Horizon also features a new generation Studiomaster mic-pre amp, incorporating ultra low noise discrete circuitry and is the only mixer in its class to feature an optical compressor on input channels. 3-band channel EQ includes mid sweep and four auxiliary sends feed the on-board effects and connections for external monitor systems. Balanced XLR and jack, and unbalanced RCA phono I/O connectivity throughout is augmented with a USB 2.0 interface for computer / digital audio player connectivity. The powered models feature twin 1000W Class D amplifiers with discrete switch mode power supplies. Commenting on these two major product launches for the Studiomaster brand, International Business Development, Sales and Marketing Director, Paul Brewis said, "Studiomaster is a company born out of design innovation, developing products to meet the needs and budgets of musicians and sound engineers, hire and installation companies working in the most competitive market sectors. The Starlight and Horizon series are products firmly rooted in that heritage, offering something unique at their price points. The Horizon marque has always represented the very best in Studiomaster portable mixers and this new series takes the product concept to new heights, with the highest performance specifications and build quality of any portable mixer series." In picture: Paul Belcher with the Starlight sound and light cabinet.